July's Jewellery Notes feature Rachel Galley. Rachel started out her career as a jeweller in 2009. Her namesake brand is split into two lines. 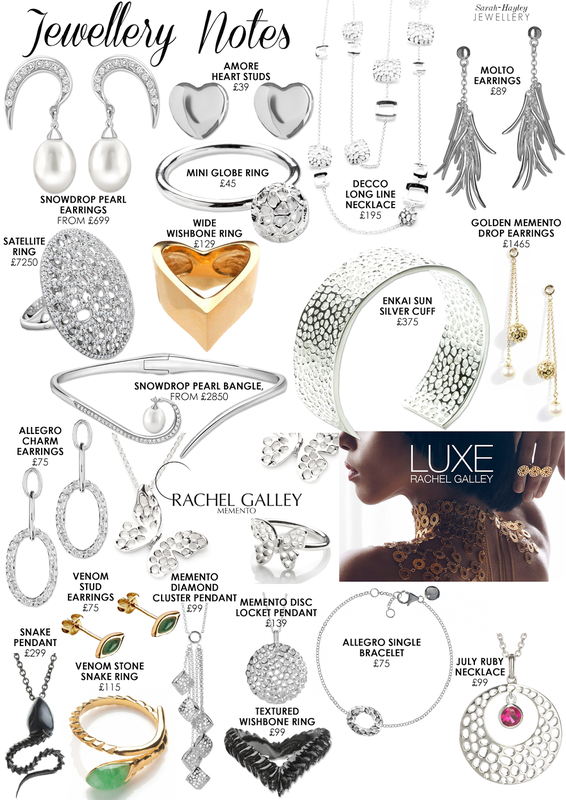 'Rachel Galley Memento' which includes a range of sterling silver pieces and 'LUXE Rachel Galley' a high end jewellery line offering limited edition pieces and made to order ranges. Rachel Galley initially found success with her brand through her latticework pieces. 'Rachel Galley Memento' draws on this success, creating collectable products with an affordable price tag. My favourite piece within the line is the Memento Diamond Cluster Pendant, constructed of six diamond lattice shapes suspended at different levels which glisten in the light. Meanwhile 'Luxe Rachel Galley' includes jewellery made from precious metals. My favourite collection is Snowdrop, a line including pearls which command attention from their dramatic lines and elegance. The Venom capsule collection was created through a collaboration with Meg Matthews. The MM collection is inspired by Meg Matthew's fascination with snakes. I love the rings in this collection and how the metal set with Jade delicately twists around the finger. Rachel Galley designs cutting edge jewellery which create completely unique collections that were made to stand out.